Animated ode to computer games. Wreck-It Ralph, the villain of a classic 8-bit arcade game, decides he no longer wants to be the bad guy and embarks on a quest to be good. Animated adventure. 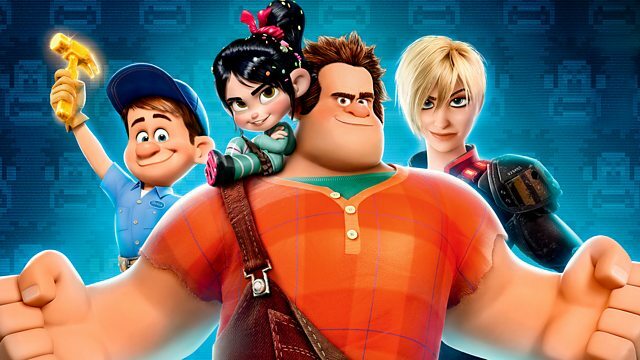 Wreck-It Ralph is a video game bad guy and is tired of always losing out to the game's hero, Fix-It Felix. Fed up of seeing Felix take all the glory, he takes matters into his own giant hands and leaves the game, going into the big wide world of the arcade on a mission to prove himself a hero. Featuring the voices of John C Reilly (Ralph), Sarah Silverman (Vanellope), Jack McBrayer (Felix), Jane Lynch (Calhoun), Alan Tudyk (King Candy), Mindy Kaling (Taffyta Muttonfudge), Joe Lo Truglio (Markowski), Ed O'Neill (Mr Litwak), Dennis Haysbert (General Hologram), Edie McClurg (Mary), Raymond S Persi (Gene/Zombie) and Jess Harnell (Don).